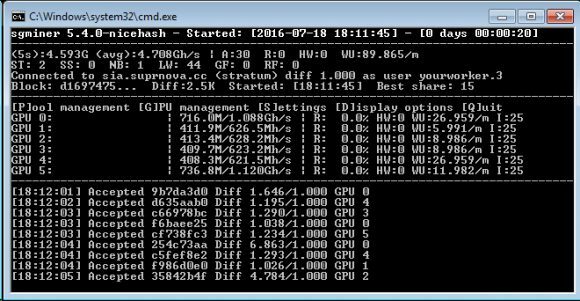 how did you get sg miner to work on nvidia gpus? Tryed a bit on win8.1 and four EVGA GTX 970. With I=25 it froze at once, had to get down to 20 – 21 but then the hash rate was rather low, around 700 – 800 for per card. does it support go miner or claymore dual miner? The pool only supports Stratum mining with the linked sgminer fork, other miners will not work for the moment. How is this pool paid? PPS or PPLNS? And what is the fee rate? I didnt see any introductions related to these concerns of mine. Anyone have an example of an nvidia bat? I got 1.8 MHs by removing the I-20 on my 970. What are the max -I settings for this miner? But can this be higher? Since the pool is in beta it does not yet have a fee, instead there is a 20% bonus to attract more miners. The default config for MPOS pools is proportional, meaning that whenever a block is found, the reward is distributed among all workers proportionally to how much shares each of them has submitted. 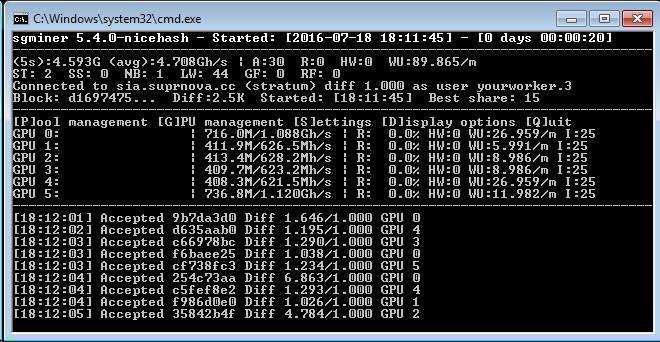 The maximum intensity for sgminer is 31, however different GPUs can handle different levels of intensity. Intensity of 25 should work on most cards and is a good starting point, though you may try lowering it if it gives you trouble or increasing it if everything seems Ok.
Something not right with this pool. Miners says I hit several Blocks yet pool claims no blocks since yesterday. 71 SC for 12 hours mining? Bargain!